We are each gifted in a unique and important way. It is our privilege and our adventure to discover our own special light. Have u ever visited GOA! Hi! 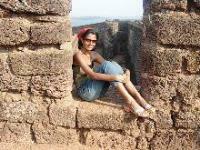 Goa,my native place is known as Ibitza of east.It is famous for beaches,Temples and churches.have u ever visited Goa?what are ur views of that place? which colour of cat you like? priti45 I like any color cats as long as they are friendly and like to cuddle. My cat just loves to cuddle. Thinking about color i like cats with blue eyes. Oh that looks too good. Gonna Be A First Time Mommy!! priti45 Hey thats amazing. Congratulations and best of luck for the future. I've seen my sister all throughout her pregnancy and now. And trust me I've never seen her so happy. My niece is now 2 yrs old and she is the sweetest thing I've ever seen. dogs or cats:which one do you prefer to be a pet? If you will own a pet which do you prefer between a dog or a cat and why? priti45 Same here... I also prefer both. Each one is special in their own way. I've had a lot of animals in my life. Right now i have one cat and one dog and i love them both equally. Do you think you have found the love of your life? priti45 good for you man.... I just hope that he is the one for me. does kate winchlet seems to be more beautiful in any movie other than titanic? priti45 yaa....... I have also wondered about this a lot. she looks so beautiful in Titanic than in any other movie she has acted in. I have no idea why. Are cats more inteligent than dogs? priti45 Well I don't know about others but mine is...... lol!!! I guess they both are intelligent in their own way. In my opinion dogs and cats should never be compared because they are two different species and are special in their own way. priti45 Hey thats bad.... i think a dog should be fed atlest twice a day. Why don't you feed them yourself if you know he is not right. Dogs are so sweet they need some respect. what will make you happy when you are depress? Have you ever visited Goa? If yes then you know it all but if no then do make it a point to visit this place atlest once. And if you are here once then I bet you'll be back for more. priti45 oh really if u have a flat there then thats gr8. Its a beautiful place. By the way... where exactly is it? We can plan something if we have a good place to stay. Tell me more about it. Can a cat hold a grudge? My first cat...have question. Do you give your cat milk? Should you? Do you believe in life after death, spirits and the supernatural?? priti45 Oh that was just beautiful. I really loved the story. Its was a bit sad but very sweet. Thanks for sharing this with us. I have a 2 month old Labrador puppy who is very very hyper. Do you know when do they start to calm down?